I was reading William’s post on the potential crash in the Bitcoin sector this morning and I thought of Carlota Perez. Longtime readers of this blog will know that I am a huge fan of Carlota’s work, her research around technology revolutions and financial capital, and her book about all of that. In 2011, I got to interview her on stage at the Web 2.0 expo, which was one of the highlights of my career. For those that are not familiar with Carlota’s work, she studied all of the major technological revolutions since the industrial revolution and how they were impacted by and how they impacted the capital markets. What she found was that there are two phases of every technological revolution, the installation phase when the technology comes into the market and the infrastructure is built (rails for the railroads, assembly lines for the cars, server and network infrastructure for the internet) and the deployment phase when the technology is broadly adopted by society (the development of the western part of the US in the railroad era, the creation of suburbs, shopping malls, and fast food in the auto era, and the adoption of iPhones, Facebook, and ridesharing in the internet/mobile era). 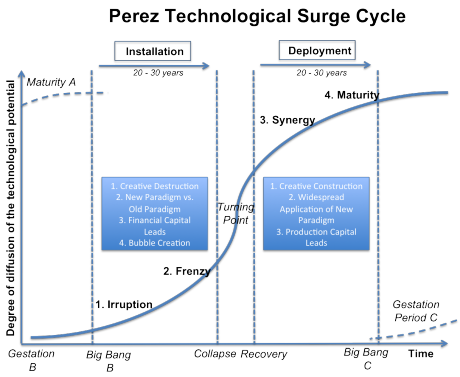 I’m not going to guess if we’ve seen the “collapse phase” of the Bitcoin technological revolution, or if we are in it, or if it is coming. But if Bitcoin and Blockchain is going to be a meaningful technological revolution, and I think it will be, then we are going to move from the installation phase to the deployment phase at some point and there will be a major financial break point that happens along the way. What is less clear to me is whether this “collapse” will be seen in the price of Bitcoin, the health of the overall Bitcoin and Blockchain sector and the companies in it, or possibly the broader capital markets (VC, public equity, etc). It seems to me that the first is very likely, the second is also likely, and the third is less likely. In any case, as my friend Tom Evslin like to say “nothing great has ever been accomplished without irrational exuberance”. And the Carlota Perez corollary to that is “nothing important happens without crashes”. And the lesson I’ve learned in my career is to invest into the post crash cycle. When you do that, and do it intelligently, you are rewarded greatly.